URBANE B. HARRIS. For a number of years prior to his decease, this gentleman was a member of the firm of Northcott & Harris, dealers in real estate, at Greenville. He was a native of Beaver Creek Township, Bond County, born February 10, 1833. His parents, John and Nancy (Goodson) Harris, were natives of Kentucky, and his father located in this county in 1826. His grandparents were Rev. William and Nancy (Hismith) Harris, natives of Virginia. The grandfather was a minister in the Cumberland Presbyterian Church and to that work devoted his energies throughout life. He was a large man, weighing two hundred and fifty pounds, and his wife weighed nearly four hundred pounds. They reared seventeen children, all of whom grew to mature years, and seven of the twelve sons were preachers in the Cumberland Presbyterian Church. Only three sons and one daughter are now living: Rev. W., of Tazewell County, Ill.; Rev. Josiah, of Clarksburg, Tex. ; Rev. Chaltam, of Kentucky; and Mrs. George Blewit, of Texas, whose husband is a minister. The mother of our subject was a daughter of William and Sarah (Maxey) Goodson, natives of Virginia, who were married in Kentucky. The father was an extensive farmer and came to Bond County in 1826 with the father of our subject. Here he continued farming until his death. The Harris family also engaged in agricultural pursuits, its members comprising seven children, who were all connected with the old Cumberland Presbyterian Church. Our subject, who was the youngest member of the family, spent his boyhood days upon the home farm, acquiring his education in the common schools. In 1855, he commenced to teach, which profession he followed for ten years during the winter season, working on a farm during the summer. In 1862, Mr. Harris enlisted in Company E, One Hundred and Thirtieth Illinois Infantry, of which he was made Captain on the 12th of August. The troops went into camp at Belleville, and after two weeks were sent to Camp Butler, Springfield Ill., where they remained until the 1st of November. They were then in camp at Memphis until March, 1863, when they went to Milliken's Bend, on the Mississippi, and from there down the river sixty miles below Vicksburg. They were attached to the Second Brigade, Thirteenth Army Corps, and the first battle in which they participated was at Magnolia Hill. This was followed by the engagements at Champion Hill and Black River Bridge. On the 19th of May, 1863, they commenced the siege of Vicksburg, which lasted forty-eight days, when the city surrendered. On the 5th of July, they were ordered to Jackson. Miss. The Rebels were driven into their works and evacuated July 16. They then returned to Vicksburg, and went down the river to New Orleans, when they were transferred to the command of Gen. Banks in the Department of the Gulf. In February, 1864, Capt. Harris resigned his commission on account of rheumatism and malarial fever, and returned to his home. He was a faithful soldier, but his arduous service proved too much for his health, and for a long time after the expiration of his service he was unable to do any work. After partially recovering, the Captain engaged in buying and selling stock, which business he followed until 1867, when he embarked in merchandising within a mile and a-half of the place where he was reared. To this work he devoted his energies for some sixteen years, and the business is now managed by his son. He came to Greenville in 1883, and for two years lived retired. He then formed the partnership with Mr. Northcott, which continued until his demise. Mr. Harris was married in 1853, to Elizabeth A., daughter of John Gregory, of Clinton County, Ill. They became the parents of four children, all of whom are yet living, as follows: Margaret is the wife of Thomas J. Hull, of this county, by whom she has three children, Grace, Harris and Alice. Luther J. is engaged in a general mercantile business at Wisetown, where he makes his home; he married Miss Bettie Sharp, of Bond County, and they have one son, Darrel. 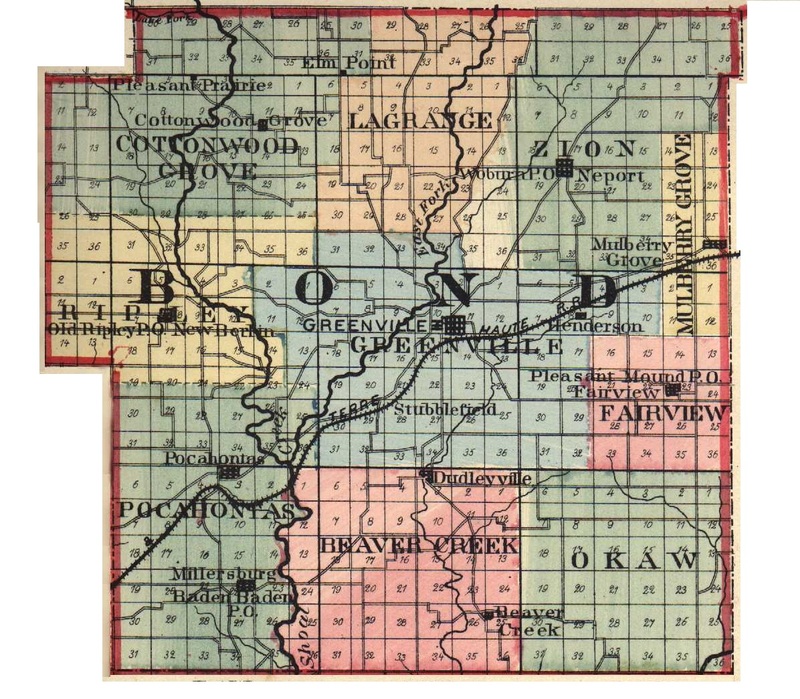 John F., who is clerk in the Woodmen's office, at Fulton, Ill., married Miss Ella Denny, of this county, and they have one son, Linden. Shaw is a student at Fulton. In his social relations, Mr. Harris was an Odd Fellow and a member of the Grand Army of the Republic. In politics, he was a stalwart Republican, and served as a member of the County Board of Supervisors for ten years, and was for a time Mayor of Greenville. He possessed a splendid physique, being about six feet in height and heavy set. In manner, he was genial, and upright in his business dealings, enjoying the confidence of all with whom he was brought in contact. It was considered a public loss when he was removed hence by death, August 7, 1891. After his decease, his widow removed to Wisetown, where she now makes her home. Extracted 21 Dec 2016 by Norma Hass from 1892 Portrait and Biographical Record of Montgomery and Bond Counties, Illinois, pages 448-449.